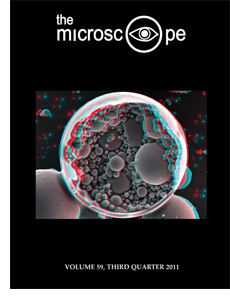 On the cover: “Celestial Spheres” Laren Cyr of MVA Scientific Consultants shows a fly ash suspension drop mounted onto carbon tape using alcohol dispersion. The sample was gold coated and then analyzed and photographed at 1,000x with a JEOL scanning electron microscope. Winner of Best SEM Photomicrograph in the Inter/Micro 2011 Photomicrography Competition. See Inter/Micro 2011. Copyright © 2011 Microscope Publications, Division of McCrone Research Institute. All rights reserved.